The GARDEN Hibicus Extra-Large Platter by Beatriz Ball features a brilliant sand-cast surface that is both eye-catching and fabulously functional. Scaled for entertaining, the platter can be used indoors and out. Beatriz Ball's GARDEN Hibicus Medium Platter features an ample rectangular surface, flanked by a pair of richly textured handles composed of delicately sculpted hibiscus blossoms. 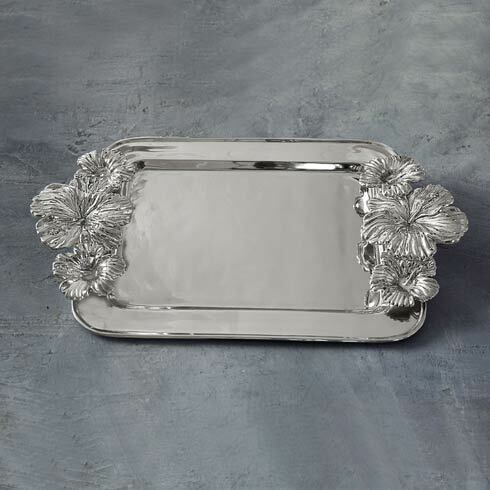 Sand-cast in gleaming metal, the platter is perfect for serving your garden fresh recipes in floral style. An original design by Beatriz Ball, handmade of a top quality, FDA safe, easy-care, oven and freezer friendly aluminum alloy.